ViewSonic's new portable projector, featuring Harman Kardon speakers and an LED-powered lamp, is now on sale. 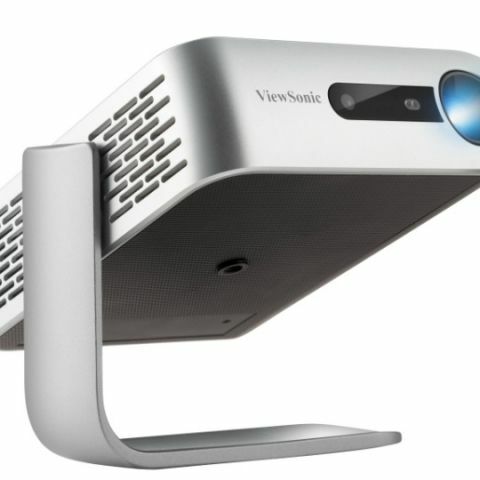 ViewSonic has just started sales of their new portable projector at a price of Rs 49,000. It features two Harman Kardon speakers and an LED-powered lamp that offers up to 30,000 hours of usage. ViewSonic Corp., a leading global provider of visual solution products, announces it has started shipping the M1 ultra-portable LED projector with built-in dual Harman Kardon speakers. Ideal for sharing instant multimedia, the iF Product Design Award-winning ViewSonic M1 ultra-portable LED projector displays convenient entertainment in just about any room at home and while traveling. For on-the-go professionals, share multimedia confidently with a built-in battery that provides up to six hours* of power, 16GB of built-in memory, and LED technology that offers up to 30,000* hours of usage.